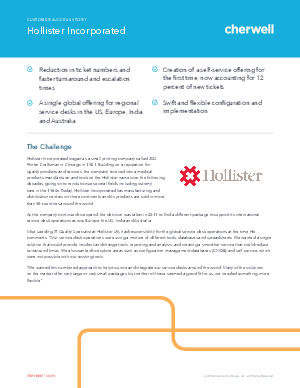 > Cherwell Software > Case Study: Hollister Inc.
As the company continued to expand, the decision was taken in 2011 to find a different package to support its international service desk operations across Europe, the US, India and Australia. Hollister launched a competitive tender to find the right solution for its needs and explored several options as part of the selection process. Mike and the team were immediately impressed by Cherwell, both by the working culture and the flexibility and ease of use of its solutions.